Apolo Anton Ohno is one of the most decorated athletes in Olympic history and the most awarded American winter Olympic athletes of all time. Apolo Anton Ohno is your Connector of the Day. Ohno has won a staggering eight medals, including two gold medals at three different Olympic games and he has also won nine world championship titles. Ohno was born in Federal Way, Washington in 1982 and initially showed talent as a competitive swimmer. At the age of 12, Ohno won the Washington state championship in breaststroke, but soon afterwards decided to focus his energy on speed skating. Ohno quickly progressed at the sport and in less than a year, he was admitted into the Lake Placid Olympic training center, becoming the youngest person to do so. The American climbed up the ranks of the world speed skating world and in the 1999 world championships, Ohno won his first silver medal. In the following years, Ohno won nearly two dozen world championship medals. At the 2010 Vancouver Olympic games, Ohno won two bronze medals and one silver. Off the ice, Ohno is a leader in the fight to eliminate drunk driving and underage drinking and works to promote responsible decision making regarding alcohol. –	What is your opinion on the way the United States Attorney General is handling Driving under the influence of alcohol? –	What is your opinion on the minimum age to obtain a driver's license in the United States of America? –	What is your opinion on the fact that the Russian Federation will host the 2014 Winter Olympics for the first time? –	When are you as former Dancing with the Stars Champion and Julianne Hough going to dance on Ice? – WHO will win the South Africa World Cup? I am awaiting Apolo Anton Ohno’s replies. You seem to have a lot of irons in the fire with your speaking engagements, book, supplements company, and ongoing sponsorship appearances. What are you doing to keep it all in perspective and to find balance? I've recently read some interesting mission statements from various athletes. You seem to be a "thinker" who considers things from start to finish. So, do you have a mission statement for your life? And, can you share it with us? Are you and Julianne still good friends and will you ever get married to each other? Or will you at least dance together again? In a TV special w/ Summer Sanders featuring your workout training for the Vancouver Olympics, it shows you wearing a beanie cap, weighted vest, adidas adistar weighlifting shoes doing a particular exercise: You were facing a wall, hands on the wall, running really fast with low pulley cables attached to both your ankles. What is that exercise for? You executed that move with such ferocity and anger!!! I was in awe watching you. Amazing! When will your foundation be officially unvailed? I think you are an awesome role model for kids. This is a personal question. Do you regret not ever dating Julianne Hough and are you still close friends? what's the youngest you ever dated? *When do you plan on getting married? *Do you ever wish that you lived in New York? *What's your favorite comfort food? -what's the age limit when it comes to girls? I hear you refer to TEAM APOLO quite frequently. Who are the principle TEAM members other than your father and Mr Shaeffer and would you consider them your mini-board of directors? Did you ever attend college? if so which college did you attend? and what did you major in? You are fervent in promoting a healthy lifestyle for all,...advocating exercise and eating well. I follow you on Twitter and know that you are constantly traveling and much of the time do so on very little sleep. Research has shown that adequate sleep is an important part of a healthy lifestyle. Can you be at your healthiest with so little sleep? Apolo I have to ask is there a difference between 19 year old Apolo in 2002 and 28 year old Apolo today???? What has been the most off the wall strange question you have been asked and what has been your favorite comment directed at you that has made you laugh? Apolo, Is it a difficult transition from training everyday to become an Olympian to getting out in the dog eat dog working world? Would you ever encourage your child to become an Olympian, now that you know what it takes to become one. Also, if you had it to all over again would you still pick shorttrack or another sport to compete in? If another sport, which one? Is there any outside interest in shorttrack becoming a professional sport? It's going to very hard to get interested in the 2014 games if your not there. 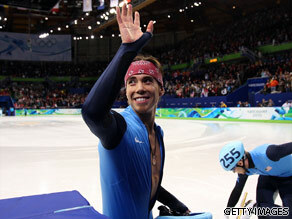 My entire family enjoyed watching you compete, you definitely made the shorttrack exciting and fun to watch. Good luck to you Apolo in your future endeavors. Have been enjoying and inspired by all you do and have accomplished. I think you are a true American Treasure. It must be awesome to have so many young and (seasoned) fans who are so interested in all you do. Your Dad is amazing for having raised a terrific young man and son. I have said before, you remind me of my grandson, so many characteristics that are the same, especially the smile. I hope we get to see some of the questions answered that were asked. You are a true Blessing!!!!!!!!!!!!! Do you want children? Do you want to work with children? Do you even like children? First, thank you for being such a light in this world. You are truly inspiring. Which leads me to my question – what inspires YOU? What keeps you on track to your goals, seemingly no matter what? Do you see yourself as a father in the future? If yes, do you think you will be as good or if not, better than your dad Yuki? You seem to be nice, approachable and forever smiling. Do you ever have bad hair days? Also, your Olympic training is so rigid. Once you retire, are you afraid that you might gain some unwanted pounds? Since the olympics, you've tweeted on several occasions that you've been working out – and that they've been especially grueling. I have a hard time imagining a workout more taxing than what you completed in preparation for the Vancouver olympics! How does your current exercise regimen differ from your olympic training workout? Apolo, you have your hand in many different projects – shorttrack, a budding business, philanthropy, an upcoming book – and you succeed in all of them. What do you feel is your greatest weakness, and what are the practical steps you take to surmount it? Hi Apolo! Your relationship with your dad inspires so many people, myself included. What is the best piece of advice your father gave you in your youth? And now that Vancouver is behind you and you are pursuing other ventures, what is the advice that he keeps repeating to you these days? Most people had never watched shorttrack speed skating before you competed in Salt Lake City, and since then you've been the sport's most recognizable athlete. If you decide not to compete in Sochi, who do you think is ready to carry the mantle of "The Future of Shorttrack" and keep audiences interested in your sport? I'd like to ask Apolo - how do you drive home the realities of underage drinking & drunk driving in a society that 'looks up' to people like Lindsay Lohan, Paris Hilton or Snookie as role models? What is your opinion about public figures (actors, athletes, etc) seen by the public as 'role models'? Do you think it's a fair label to give someone that may or may not want it?